There is no alternative of that. It does not matter how good you are at marketing your content, if it is not good enough, it is never going to be a success. Moreover, Medium is a platform where so many great writers and content marketers hang out. Just like it is on Quora, Medium users want to see high-quality and useful content. You have to give them that if you want to succeed at it. Apart from that, another important thing to note here is that Medium is more accommodating to content that is inspiring, motivational, and uplifting. And this leads to our next marketing tactic. Each content marketing platform is best suited for a particular type of content, and so is Medium. Before you start publishing content there, you need to study what works best. If you keep throwing stuff at a wall and see what would stick, you will most probably fail. Achieving success on Medium isn’t a shot in the dark; it is often a well-planned strategy that leads to success. You can also do your own research and come up with the types of contents that work best on Medium. Here is how you can do it. 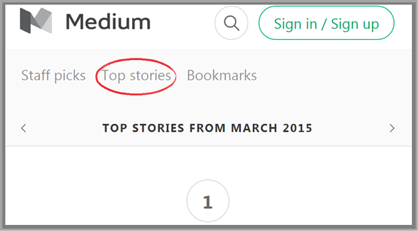 Log into Medium and filter stories by ‘Top Stories’. Read as much content as you can and try to find aspects that are common in each of the top stories. Soon you will be able to come up with a magic formula that most probably will work. Clickability is the key to viral content. Moreover, in a platform like Medium which is usually swamped with thousands of posts, you need to have amazing and attention-grabbing headlines. Nobody will bother to read your content (despite how good that is) unless its headline is good enough to attract readers. If the headlines of your posts have these two qualities, they are likely to perform better. Once you have perfected the title or headline of the post, it is time to choose a good image to complement it. My suggestion would be to create an image that is not only unique and interesting, but one that also reflects your content marketing brand. You can use that “sense of familiarity” to create and promote your online brand which will only help you in the long run. Just because you have published a good piece of content on Medium doesn’t mean that you are all set for success. Thousands of content marketers do the same thing everyday. You have to take it one step further and utilize your social media profiles for marketing and online promotion. Remember that the first couple of hours are critical. Promote as much as you can during that period — use Twitter, Facebook, Pinterest, email lists — and based on the traction your post gets, it can become a hit on Medium. Achieving success on Medium isn’t a shot in the dark. The successful content marketers that you see on Medium have proven methods that they religiously follow. Try using these 5 marketing tactics to achieve success on Medium, and you will also see better results. "We continue to show PageRank in the Google Toolbar mainly for the average web surfer who wants to get a general idea of the importance of a webtpge.&quoa;Just curious... is there any evidence as to how many average web surfers pay much attention to the pagerank value in the toolbar? I'm not sure anyone I know who's not a webmaster even knows what it is.